ON4KST telnet based client for Windows (tested on: 98, 2000, XP, Vista and 7) that is tailored to the ON4KST Chats. Instead of the normal raw telnet look and feel KST2Me provides a web based appearance while maintaining the bit lean connection and telnet speed. Peter, OZ1PIF, confirms that KST2Me runs on Ubuntu (12.04) with Wine (1.4). Harry, LZ1BB, has verified that KST2Me runs on Linux too. Yoann, F4DRU, is using KST2Me on an Eee PC (4G), with Linux (eeeXubuntu 7.10 release 3) and Wine (0.9.46). Riccardo, IK5MEN, Robert, KD5PBR, and Serge, RA3WND, are using KST2Me on Ubuntu Linux. Marco, IW0FFK, is using KST2Me on Mac OSX with Wine for Mac emulator. Bo, OZ1DJJ, is using KST2Me on Linux Mint with Wine. You MUST be registered on the ON4KST Chats already as this cannot take place via telnet. Unzip the downloaded archive into a directory of your own choice. Contact Bo, OZ2M, on this webform to get a program registration key - it is free and is used for my own amusement only. Once received unzip and save the registration key file in the same directory as the KST2Me.exe file. Run KST2Me.exe to start the application and fill-in the set-up information and QRG ranges and start chatting. When you want to update just download a new zip-package and replace the KST2Me.exe file. Use the help available from the menu. The field in front of the chat message input is a preamble string, i.e. callsign, of the other station you are chatting with. A preample, with your call, sent by another station will show the message on pink background. In all of the subpanels clicking and right clicking, calls, messages, locators etc., provides additional features. To clear a label simply click it. If you intend on using KST2Me from a mobile/wireless connection that you pay for check out Uffe's, PA5DD, GPRS tips. Even though it is about GPRS you can also use the tips on e.g. WLAN/Wifi or 3G networks. You can run multiple sessions of KST2Me either from different directories or using a command line parameter e.g. KST2Me.exe 2. Q: Sometimes the number of past messages or DX-cluster spots do not correspond to the number(s) set. A: If the past messages or DX-cluster spots are to old they are not sent at log on because they are not stored on the chat server. Q: Not all spots on 70 MHz are shown when "Check 70 MHz spots" is enabled. Q: How can I change the scrolling direction? A: This is not possible. The user interface is made the way it is to provide the best ergonomics. Q: KST2Me says my key is about to expire. What do I do? A: Just use this webform to renew your key. Q: How can I use KST2Me with different settings without having to change it every time? A: You can do this by executing KST2Me with a command line parameter, e.g. KST2Me 2 then the corresponding .ini file will be named KST2Me_2.ini. Q: How do I change the connection from the Master Server to the Slave Server? A: You only need to do this if the master server is down! This trick is NOT recommended and NO support is given. To run on the master server again delete 3. or change to !Host=on4kst.dyndns.org. Do not use the slave server unconditionally because Alain, ON4KST, from time to time uses it for testing purposes. Q: Why can I not write some or all of the letters that belongs to a certain alphabet? A: The telnet protocol does not contain all the letters, and symbols, belonging to different languages. Q: Do I need a new KST2Me_YourRawCall.key when I upgrade to a newer version of KST2Me? A: No you can use your existing key. Q: When I double click the KST2Me_YourRawCall.key file Windows will not accept it. A: All you have to do to "install" the KST2Me_YourRawCall.key file is to place it in the same directory as the KST2Me.exe file. Q: KST2Me says "invalid program key." A: Either you do not have a KST2Me_RawCall.key file, the key file is not located in the same directory as the KST2Me.exe program file or your RawCall in the set-up does not match the key file. Q: Windows (Vista or 7) does not allow installing/running KST2Me. A: If you try to install or run KST2Me (or other Microsoft unregistered program) into C:\Program files\KST2Me you have to lower the security level for the KST2Me directory otherwise KST2Me will not install/run properly. Do this by right clicking the KST2Me directory in Explorer and change the security level. Q: KST2Me cannot connect to the chat. A: KST2Me has to pass the firewall so please check your firewall settings. Q: KST2Me is included in my boot sequence and auto connects to the chat but is then disconnected. A: If you have problems with connecting directly after your PC has been booted and have KST2Me included in your Startup folder and have auto connect enabled then increase the "Connect to chat delay when KST2Me starts" in the setup. Most likely the problem is caused by the firewall starting after KST2Me is started and connected and then the firewall shuts down the connection when it starts. Q: KST2Me says my "Your callsign ... is not registered on the chat." why is that? A: The "Your callsign ... is not ..." response is sent from the chat server, KST2Me just displays it. You MUST be registered on the ON4KST Chats already via as this cannot take place via telnet. Q: KST2Me says my "password is incorrect" but I am sure it is not. A: The "password is incorrect" response is sent from the chat server, KST2Me just displays it. Please try to log in via e.g. the web to the chat with the exact same password as a way to verify the password. Q: I cannot connect to the chat why that is? A: It might be that you have set Internet Explorer to work "Offline." For some odd reason this affect some other programs in Windows access to the Internet. If this is the case then from the IE Menu | File uncheck "Work offline." Q: No DX-cluster spots are shown. A: Please select the QRG range(s) you wish to see in the Tools | Setup QRG Ranges. Q: When I make a DX cluster spot the chat responds "08:02 SERVER Message EA7URC-5 CLX cluster failure" - or another cluster. A: This is because there is a problem with the connection between the chat server and the DX cluster you have selected. 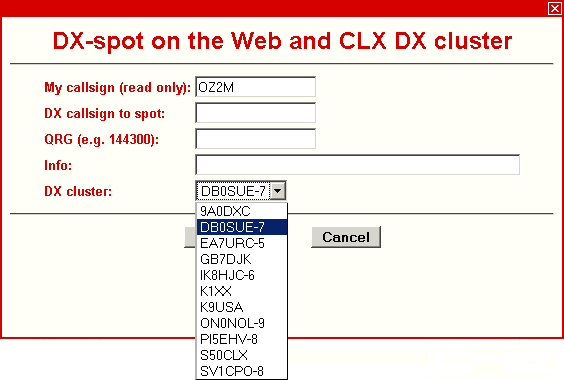 You can chose to wait until the connection is OK again or via the web chat change the DX cluster your spots are sent through. Unfortunately you cannot do the latter via KST2Me because it is not possible via telnet. Q: I can see spots from other stations but I cannot see my own even if the chat responds with "Server Message - DX spot sent." A: This is a problem with the cluster you use via the chat. The problem is not the KST2Me or the chat. Please report the problem to Alain, ON4KST. Alain will then contact the system operator of the DX cluster. You can chose to wait until the connection is OK again or via the web chat change the DX cluster your spots are sent through. Unfortunately you cannot do the latter via KST2Me because it is not possible via telnet. Q: Changing the sound levels do not have any impact. A: To be honest I haven't got a clue. This is a general issue in Windows Vista. I hope/think a solution will be available later.